News dal mondo PostgreSQL Italia a cura di ITPUG. ITPUG è una associazione no-profit per la promozione e divulgazione di PostgreSQL e del Software Libero (FLOSS) in Italia. E` cura dell'associazione organizzare la conferenza annuale PGDay.IT. Le iscrizioni all'associazione sono aperte puoi iscriverti o rinnovare la tua iscrizione online. A quick start guide on implementing and deploying code to PostgreSQL. PostgreSQL 11 Server Side Programming - Now Available! 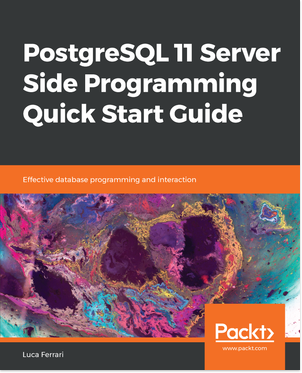 Near the end of November, Packt published the book PostgreSQL 11 Server Side Programming Quick Start Guide, authored by me. This post has the only aim of describing the book contents and the reason behind choices related to it. Following a consolidated tradition, Packt is producing more and more books on PostgreSQL and related technologies, and this is the first one that covers aspects about the freshly released PostgreSQL 11 version. Nevertheless, this does not mean that the book is only for PostgreSQL 11 users and administrators: it covers topics, concepts and provide examples that can be use as-is or ported to older versions of PostgreSQL, as well as probably to newer ones. In fact, while the book code examples have been tested against a PostgreSQL 11 cluster, only the examples related to the new object PROCEDURE, introduced by PostgreSQL 11, are strongly tied to such a version. This book is a Quick Start Guide, and therefore it has a very practical approach to a limited scope, and only that. Therefore the book assumes you are able to install, manage and run a PostgreSQL 11 cluster, that you know how to connect and how to handle basic SQL statements. A basic knowledge in general programming is also required. My book about programming on the PostgreSQL side! Yesterday my first commercial book in the PostgreSQL landscape was officially published: PostgreSQL 11 Server Side Programming Quick Start Guide! Is this only about version 11? The book code has been tested against version 11, but despite the title it is enough general to be used as a basis for pretty much any recent version of PostgreSQL. Of course, some parts cannot be executed on older versions, like for instance the procedures chapter. However, concepts and samples can be adapted also to older versions and are therefore enough general to get a good introduction to server side programming. This book is a Quick Start Guide, so it is a short book on a very specific subject, that means it will not teach you about PostgreSQL management in general, and assumes you are able to install, run and connect to a PostgreSQL 11 instance. The book starts with a chapter dedicated to query tricks: the usage of UPSERT, RETURNING and recursive CTE in order to take advantage of these PostgreSQL features when dealing with common day-to-day tasks. I have already written about a very useful and powerful small pearl by theory: pgenv. Now the tool does support for user configuration! I spent some time implementing a very rudimental approach to configuration for pgenv. The idea was simple: since the program is a single Bash script, the configuration can be done using a single file to source variables in. But before this was possible, I had to do a little refactoring over here and there in order to make all the commands behave smooth across the configuration. And at least, it seems to work, with some parts that can be improved and implemented better (as always it is!). However, I designed from scratch to support every single version of PostgreSQL, that means configuration could be different depending on the specific version you are running. This allows, for example, to set particular flags for ancient versions, without having to get crazy when switching to more recent ones. pgenv is a shell script that allows you to quickly manage multiple PostgreSQL installations within the same host. It reminds somehow perlbrew (for Perl 5) and systems like that. In this post I briefly show how to use pgenv as well as I explain which changes I made to it. pgenv is another pearl from theory. It is a bash single script that allows you to download, build, start and stop (as well as nuke) several PostgreSQL installations within the same host. It is worth noting that pgenv is not, at least now, an enterprise-level PostgreSQL management tool, rather an easy way to keep test instances clean and organized. It can be very useful to keep several clusters on which doing experiments, testing, and so on. I first discovered pgenv reading this blog post by David, and I thought it was cool to have a single script to help me manage several environments. I must be honest, this is not the first tool like this I have seen for PostgreSQL, but somehow it caught my attention. I then cloned the repository and start using it. And since I’m curious, I read the source code. Well, ehm, bash? Ok, it is not my favourite shell anymore, but surely it can speed up development while shorting the code with respect to more portable shells. PostgreSQL uses a simple trick to recognize if the server has started in single-user mode. First of all, what is /single user mode/? It is a special way to connect directly, as a single user, to the PostgreSQL storage, that is the database. Since each conenction is server by a postgres process, single user mode means that a single process attached to the current terminal will run. The server will not accept any incoming connection, the user can interact with the server and its storage being sure he is the only user connected to the system. How can PostgreSQL knows if it is running in single user mode? Let’s start from the bottom: query a server about its status and see if it is in single user mode. Rules are a powerful mechanism by which PostgreSQL allows a statement to be transformed into another. And PostgreSQL itself does use rules in order to make your life easier. When asked for a quick and sweet example about rules I often answer with the pg_settings example. The special view pg_settings offers a tabular decodification of the current cluster settings, in other words allows you to see postgresql.conf (and friends) as  a table to run queries against. It simply reads as: whenever there is an update keeping untouched the parameter name, invoke the special function set_config with the parameter name and its new value (the flag f means to keep changes not local to session). For more information about set_config see the function official documentation. pgxnclient is a wonderful cpan like tool for the PGXN extension network. Unlickily, the client cannot handle PostgreSQL beta version, so I submitted a really small patch to fix the issue. If you, like me, are addicted to terminal mode, you surely love a tool like pgxnclient that allows you to install extension into PostgreSQL from the command line, much like cpan (and friends) does for Perl. A few days ago, I run into a problem: the `load** command cannot work against a PostgreSQL 11 beta 2 server. At first I reported it with a [ticket])https://github.com/dvarrazzo/pgxnclient/issues/29), but then curiosity hit me and I decided to give a look at very well written source code. Warning: I’m not a Python developer, or better, I’m a Python-idiot! This means the work I’ve done, even if it seems it works, could be totally wrong, so reviews are welcome. PostgreSQL 11 and PL/Java: it can work! PL/Java is a wonderful piece of code that allows the definition of functions in Java directly within PostgreSQL. Unluckily, PostgreSQL 11 introduced a few changes that made PL/Java not compiling. But keep calm, experts are already working on this! If you are in a rush and want to experiment with PL/Java 1.5.1 Beta and PostgreSQL 11, have a look at this pull request. First of all, I’m used to serve PostgreSQL over FreeBSD, and this is not the optimal situation because a lot of code is written with Linux in mind and requires some adjustements when compiled/ported over other Unix implementations. PL/Java is an example: it compiles thru Apache Maven, that in turn seems to require GCC, that is not the default compiler on FreeBSD and … you get the point. However, with a little work, it is possible to compile PL/Java even on FreeBSD (as you can imagine) and this is what I’ve done so far. But last monday, trying to compile it against PostgreSQL 11 beta 2, quickly resulted in frustation. Luckily, and thanks to the great PL/Java, I found that due to a change in the PostgreSQL 11 GUC definition, things could have been adjusted to make it compiling. After one day, all of my PL/Java code seemed to be running fine with this simple workaround (and yes, I don’t have code that complex, so this does not mean the workaround is production safe!). I therefore decided to open a pull request about it. PostgreSQL 10 allows users to define extended statistics to help the planner understand data dependencies. PostgreSQL 10 defines a set of extented statistics, mainly for intra-column dependencies and distinct values. New commands have been added to create and rop such extended statistics, and this post just covers the surface of this new feature directly as long as I was experimenting with that (and as usual, comments are welcome!). column incoming is true when the value is greater than zero, false otherwise. Sqitch has nothing particular to do with PostgreSQL, except it does support our beloved database! Long story short: if you are not using sqitch you should give it a look. sqitch does not ties itself to only PostgreSQL, but it does support a lot of relational engines. However, if you want to know how to start using Sqitch over PostgreSQL go read the excellent Introduction to Sqitch on PostgreSQL. I’ve already written about sqitch in the past (in italian). a test script (how to check the deploy succeeded). Around a month ago, the sqitch creator, David E. Wheeler, created a GitHub Organization named sqitchers that now holds all the Sqitch related stuff including, obviously, the codebase for the project. At the same time, the Sqitch steering committee grown, and this is a good thing since this project quickly became an handy tool for database management. In conclusion, sqitch is growing and getting more free every day. If you are curious about project history and explaination by its own creator David E. Wheeler, I suggest you listening to this (old) FLOSS Weekly podcast. How to cascade changes to a view over a table? In a lectur on PostgreSQL a participant came up with a puzzling question: how to cascade an ALTER COLUMN from a table to a view? There are two main approaches: using the power of DDL transactionable commands or alter the system catalog. In this post I explain how to do both. I’ve completed another short course on PostgreSQL, this time online with written material. PostgreSQL BSD Magazine course ebook is now available! I’ve completed the material for the BSD Magazine PostgreSQL intermediate course and a final ebook has been produced and is available for purchase: Improve your PostgreSQL Skills ebook. If you missed the course and want to get the material, including exercises and solutions, you can buy the ebook form the BSD Magazine Web Site. In the case you do purchase the ebook, please send me a feedback to allow me and the magazine to improve a possible future version. And if you are guessing, all the written material has been produced using Emacs org-mode against a PostgreSQL 10.3 database. plperl does not allow direct sub invocation, so the only way is to execute a query. The official plperl documentation shows you a way to use a subref to invoke code shared across different plperl functions via the special global hash %_SHARED. While this is a good approach, it only works for code attached to the hash, that is a kind of closure (e.g., a dispatch table), and requires each time an initialization of the %_SHARED hash since plperl interpreters does not share nothing across sections. I’m preparing another short course on PostgreSQL, this time online with written material. BSD Magazine is delivering a PostgreSQL intermediate course with my own material. I’ve been writing articles for BSD Magazine for a lot now, and many of them with the PostgreSQL subject, so according with the editors, we decided to create a full course with 5 modules and written material to allow readers to get a more detailed view on PostgreSQL capabilities. The course will be performed by presenting attendees written material with examples, exercises and offering online support for doubts and questions. This course is an intermediate one, meaning it will not cover basic concepts like installation, SQL basic statements, psql and connection strings, and so on. The topic list is available on the course page. I would like to thank BSD Magazine editors for the great opportunity to spread again the word of PostgreSQL! PostgreSQL built-in plpgsql can be used to build stored procedure and, with a few tricks, to consume data and translate it into other forms. It is also possible to generate a so known codice fiscale, the italian string that represents the tax payer number based on the person’s name, birth date and place. This posts will show some concepts about how to generate the single pieces of the codice fiscale via plpgsql. And why not? Let’s compare it to a plperl implementation. In order to provide a quite complet example of usage of plpgsql for a course of mine, I developed a few functions to build up an italian codice fiscale (tax payer number). The idea is not to have a fully working implementation, rather to demonstrate usage of different operators and functions in plpgsql. And to compare its implementation with a plperl one. In order to generate a full “codice fiscale” you need to extract some letters from the surname and the name, build a string representing both the date of birth and gender, a code representing the birth place and last comes a character that works as a checksum of all the previous parts. I’m doing a short course on PostgreSQL, with particular regard to the 10 edition, in Modena. Thanks to the local Linux Users’ Group (LUG) /ConoscereLinux/, that provided all the infrastructure for the course, I wiil introduce attendees at basic SQL concepts and how PostgreSQL works. The course schedule is available at the official course page, and the course will be based on 6 lessons (2 already done). Attendees can come with their own laptops, and lessons will be “live”: I will show concepts while explaining on my own laptop running PostgreSQL 10.1. All the slides will be available for free on the course page, and are based on my work available on my github repository. The course will take place every week on Tuesday evening. with particular regard to Luca and Massimiliano, for both giving me such chance and, most notably, for waiting me to be ready after my last eye-surgery, and driving me home! Qualche mese fa avevo espresso brevemente alcune considerazioni sul futuro dell'aggregatore di blog dell'associazione ITPUG, ovvero il Planet PostgreSQL Italiano. La mia preoccupazione era dovuta al fatto che nei primi mesi dell'anno corrente non vi erano stati post relativi all'associazione e al mondo PostgreSQL in generale, e infatti facevo notare come solo io avessi pubblicato 13 post fra Gennaio e Aprile. Ancora una volta sento la necessità di sollecitare l'associazione e il consiglio a valutare l'utilizzo di questo strumento di aggregazione e informazione, che risulta ormai evidentemente abbandonato a se stesso e in rapido declino di contenuti (a differenza del sempre aggiornato Planet PostgreSQL. PostgreSQL 10 fa finalmente capolino nel mondo con il rilascio, ieri, della prima beta release. di compilare i sorgenti, anch'essi scaricabili come archivi. la piattaforma italiana ad essere trascurata, ma il sistema di pubblicazione di notizie e articoli in generale. Possibile che in un periodo di circa 3 mesi ITPUG non abbia avuto nessuna notizia da pubblicare? dell'imminente assemblea ordinaria, non vi sono notizie a riguardo. allora lo si deve popolare periodicamente. Sono venuto a conoscenza per caso di un progetto interessante: SpeakerFight. L'idea è abbastanza semplice, e l'implementazione mantiene la semplicità: si inviano dei contributi di talk (per conferenze ed eventi) e si lascia che le persone li votino, in un meccanismo stile "star" ben noto da altre piattaforme. I talk/contributi che hanno ricevuto il maggior numero di voti vengono selezionati per l'evento. Un paio di giorni fa ho proposto di valutare questo meccasnimo nell'ambito del PGDay.IT. Da tempo sono sostenitore di una call-for-papers piu' aperta e con selezione maggiormente trasparente rispetto a quanto è avvenuto nelle ultime edizioni. Anzi, a dire il vero ho anche proposto piu' volte di fare un "speaker fight" del poveraccio addirittura per il keynote, proponendo di chiedere alla community chi fosse interessato a fare un keynote speech invece che andare su singolo invito diretto. Ora sistemi come quello qui descritto hanno, ovviamente, i loro svantaggi: per esempio si potrebbe votare molto un talk tenuto da un perfetto incompetente che risulterebbe in uno speech di pessima qualità, trascurando magari talk meno "accattivanti" ma di sicuro successo ed impatto. E forse alcune persone non vogliono selezionare di propria volontà i talk, quanto lasciare che siano gli organizzatori a "stupirli" con contenuti all'altezza di stimolare la curiosità e l'intelletto. Tuttavia è difficile rimanere in un ambito o nell'altro se non si hanno dati alla mano circa il gradimento delle precedenti edizioni (questione che spesso ho sollevato). Personalmente ritengo che aprire almeno una porzione del PGDay.IT ad un sistema di votazione diretta possa dare quella spinta ad autori e partecipanti per sentirsi maggiormente coinvolti e, soprattutto, per poter decidere il livello dei contenuti da visionare, garantendo quindi una maggiore partecipazione (almeno in teoria). Il legame tra Python e PostgreSQL appare sempre piu' forte. Se da un lato ITPUG sarà anche per questa edizione media partner della conferenza italiana PyCon 8 , la community PostgreSQL viene citato nella sezione Community per l'internazionale PyCon 2017.